Although Jacob and Esau were twins, Esau was born first to Isaac and Rebekah, so he had first claim upon his father's estates and on his blessing. Because of this, Jacob envied Esau, who valued his birthright so little that once he sold it to Jacob for a mess of pottage. Isaac paid no heed to this youthful bargain, and when it was time for him go give his blessings to Esau, he sent him out to get venison for a feast. Rebekah, however, was determined to secure the coveted benediction for Jacob, who was her favoirte. She urged and commanded Jacob to to to his father in Esau's place. This trick was made possible because Isaac had become almost blind. 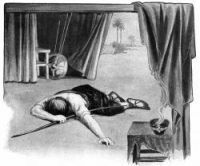 The scheme was successful and Jacob was blessed This was Jacob's one great crime, by which he and his mother ruined their lives. When Esau returned with the venison, Isaac, despite his blindness, realized almost immediately what had happened. He was both grieved and angry, yet he saw that since this deed was accomplished it must have been the Will of God. Esau pleaded with his father to bless him as well, but Isaac sadly declared that the blessing had already been given. 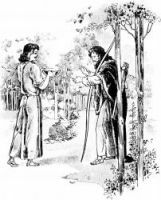 These illustrations of brothers Jacob and Esau are from several Bible books in my collection. Feel free to use Jacob and Esau drawings in your artistic creations. 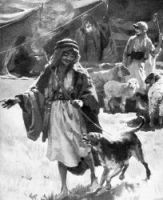 Click on the Jacob and Esau pictures below to see more details about saving a free Jacob and Esau image or about purchasing images of Jacob and Esau at a higher resolution.